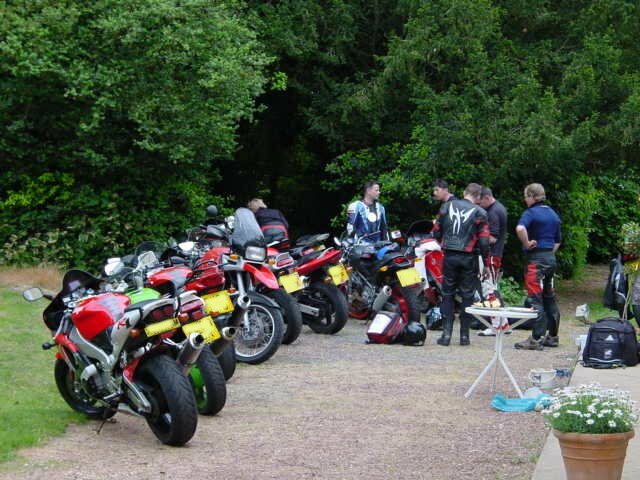 We've been down here for coming up to 19 years now and we're into our 17th year of running these biking weekends. If you're fed up with the congestion on Britain's roads, fed up with the weather and fed up with the sheer impossibility of having any FUN anymore, then come down and see us. We'll take you out over FOUR full days of riding to cover a total of 1,200 kms of some of the best roads you will ever ride down. In the evenings you'll be treated to a gastronomic feast while listening to your new friends bang on about their choice of tyres. And all this for the price of a trackday (well...it's now a post-Brexit September 2018 and so it would probably be more accurate to say "...all for the price of a case of Prosecco") Never mind, you can't take it with you... Come on, come on, whatever level you're at with your riding it will improve. Dates are for INCLUSIVE nights. 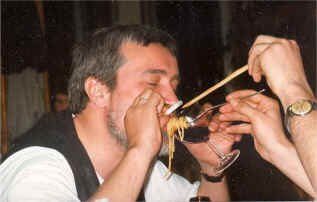 Half-board (breakfast and dinner) with all wine and beer included during dinner. (NB: The prices for the weekend do NOT include ferry costs. You should book these yourselves. Just send an e-mail to the site address, letting me know the dates and the number of people you'd like to book for and I'll get back to you asap. Make sure that your travel insurance provides cover in the event of your having to cancel your holiday! Please note that we do not run the weekends if there are less than 6 participants. We will attempt to give you as much notice of a weekend cancellation as possible but, by definition, these decisions tend to be taken quite late in the day... We will however try to give a minimum of one month's notice. In this event we will refund you all monies paid in advance to us, but are not liable for any other charges you may have incurred. You will make your own way down to the Chateau in order to arrive here on the Thursday afternoon. The best route is an overnight ferry from Portsmouth which will get you into Le Havre, Caen or Cherbourg early in the morning. You then have all day to ride down here at a relaxed pace. The next FOUR days are all about riding. Departure is on morning of the Tuesday following your arrival. We use the "drop-off" system when on the road (see "How we ride"), so nobody ever gets lost and everybody can ride at their own pace with no pressure to ride at a rate that they don't feel comfortable with, nor have to plod along at the rate of the slowest rider. If you haven't ridden in France before you'll be amazed at the welcome you'll receive from the people here. Policemen will wave (you down....), traffic will be light and will be trying to help you wherever possible by getting out of your way; the myth of the little café terrace, in the middle of nowhere, where we stop to take on coffee and water and to regale each other with our tales of derring-do is TRUE! There'll be lots of coffee stops, lunch in a little local restaurant and more stops in the afternoon. You'll come home to the Chateau tired, but with your eyes popping out of your head, ready for the next day's roads. You'll park the bike up and grab a cold beer, before hitting the showers in preparation for dinner and another round of "Did you see me when.....?" People have complained that I haven't said enough about the FOOD!!! So here goes: It's French, 4 courses, plus the aperitif (and nibbles), wine and/or beer included. All the cooking is done by me (still in leathers) and my sensational cook/much-better-half, Violette. 100% French she rules the kitchen like a kitchen ruler and always seems to have just a hint of flour in the lock of hair that falls provocatively across her eyes... The dishes are prepared with seasonal vegetables and therefore change all the time through the year. We go to a lot of trouble to put really interesting and challenging foods on the table so make sure you finish it ALL or we get very upset. You WILL try new things when you're down here and you WILL enjoy them. Don't forget, I hale from the Basil Fawlty school of hostelry. Seriously though chaps, steady on! We have a lot to say, and sometimes our guests do too! Sorry. I had a fuse blow for the previous picture. Just had two slots open up. Grab em! You know you want to! Has anyone bagged these places yet?? Yay! Full House. An INCREDIBLE 18°C this afternoon. The Beast was loving it. 😭😭😭😭 pourquoi je travaille ! ! ! Amazing what a lick of paint and a new can does! Nice .... I shall be on the Red dwafs slightly mad offspring in June. Looks great. Fab weather here and a biking weekend looms. 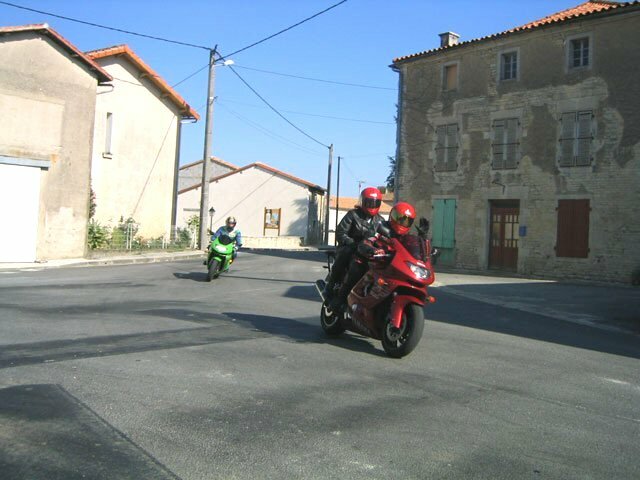 Love the 1100/1150s, run forever, my 1100RT was still touring Europe two-up at 80k+ and rode superbly; the fairing was better than my K1600GT! Well, jingle my bells.....what a disaster! Me mam's in hospital after falling down on an ice-covered pavement and breaking her hip. Joy! NOT what you want to happen when you're 60 years old! My daughter from my first (and, it has to be said, only) marriage is stuck at Heathrow at the Radison Hotel, getting into the festive mood on room service and the mini-bar. She "may" get out this pm. meanwhile the temperature here has plummeted to 9C and there's been a flurry of snow reported somewhere not far from here. I've sandbagged the tennis court and am prepared to fend off starving Brit tourists with my wasser-kanone. Happy Christmas to you all, Peeps! And so to hospital where I finally had the pin removed from my left tibia. It's been in there since 2005 and I've been meaning to have it out for a number of years now. My pet surgeon (see 4 Sept above) smuggled me out of the hospital and took me home for dinner and then slipped a bottle of wine in my cabinet the next day for post-op stimulation. Love it! Well, the painting's almost finished and Ian is departing Monday. Final dates for 2011 are up on the board. Get booking. 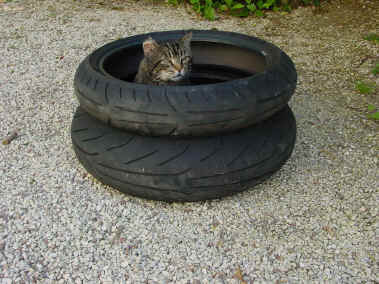 Been thinking about my experience on the lad's S1000RR and it appears that the problem might be down to the tyres. He's got Pilot Power Pures fitted and BiKE mag said that they were awful on the S. Maybe that was it. Certainly everything I'd initially loved about it turned to dust when I tried it with those tyres on. And a thought for Dave, who loved coming down here and who will be sorely missed by us and all of those of you who met him. This is the week we inaugurate the FLASH Facebook page. You'll be able to get your own back in pics and comments. Hang on! An excellent weekend. Jimmy was down again for the 2nd time this year (his first visit coinciding with the Great Cyclist Cull) Really good riding. Fast but steady and with everybody giving themselves plenty of room.... the more I think about it, I think this is the key to safe riding......Dave bought himself a textile jacket from the local Triumph dealer with runes on it. Spent most of dinner mumbling in Elvish. A complaint comes from the FOUR guilty parties, caught slightly over the speed limit last month. To whit: "Not sure I like being held up as an example of some terrible crime against biking sanity on Tony's Blog...perhaps a caveat could be added..."D* made us do it!!!" "J** made us do it faster" Warning: Don't change your destination or arrival time by a significant amount 5 minutes before you leave. Warning: Control your urges to eat; all bodily functions are subordinate to completing twisties (when you're in a rush) Warning: Never rely entirely on SatNav (even the latest and greatest can be wrong) Warning: Long Distances require different planning techniques when using a limited size fuel tank (eg Dct* 1098 or 1198)"
Hmmmm......food for thought. FOUR of our stalwarts got stopped on the way home for speeding on the m'way, 80 kms outside Le Havre. Very, very large fine and an immediate 2-week ban which meant they had to hire a truck to carry them and their bikes to the port. I know that when you're late for the ferry the temptation is to gun it, but in this case not only did they miss their ferry but will remember the day for a long time to come. 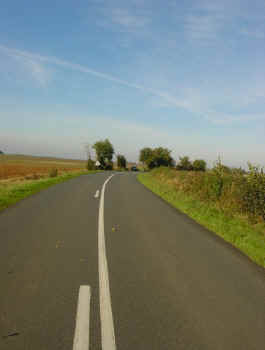 On m'ways, Route Nationales and/or any long straight, be VERY circumspect about winding it on. They ARE out to get you! Further to the above, the only good news is that the ban does not apply anywhere other than France and there are no points on the license. How long is THAT going to last before Brussels decides to allow cross-border penalties? Took the S1000RR out for a blat y'day. Found that it's not very comfortable :-) and in a bumpy bend the movement of the bike is transmitted via your wrist to the throttle, resulting in a rather unpleasant pogo-ing effect. Or is it just me? Realised that virtually ALL incidents that occur down here are due to the rider not giving himself enough space to see what he's doing, where he's going etc. 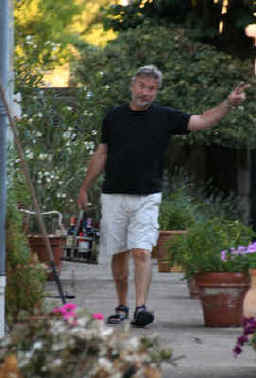 SPACE OUT, MAN! Very proud of the group I served Ox-tongue to, in a hot and sour sauce. They all pretended to love it. Had the Irish back again early on in the year. Love those guys! Contact us by by the form below for preference in the first instance. Once your booking has been accepted then communication will generally be via email. During the tour, mobile numbers for Lead riders will be shared out as necessary. Looking for a place to stay on the way down here? Take two days to come down and you've got yourself two EXTRA days of super roads. 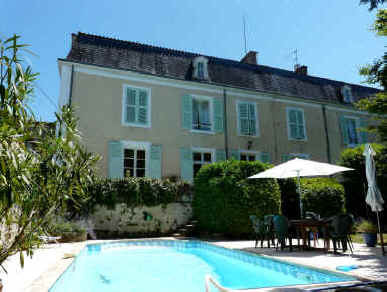 Stay here: "Hotel Le Saumon" at Verneuil-sur-Avre. It's halfway down to here from Calais and is really very good. I can give you "twisty" route cards all the way to here. Ferries: All bets are off as far as ferries are concerned....it's a mad world out there but you can always grab a discount if you use the current MCN booking code. -DUCATI- Snells of Alton Nick has recommended these guys and he should know, he spends all his time and money there (ho-ho). 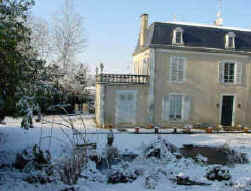 B&B in "Suze" near Dijon - Right! You've GOT to try this one out. It's run by a friend of mine who is totally barking and who's given up her career as a super-model and body-double for Angelina Jolie and started up a biking B&B with rideouts, having NEVER swung her leg (for it is a she) over a bike before 2006. 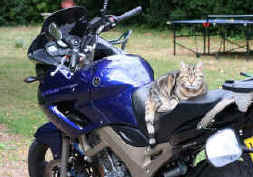 Full marks to her and let it be known that she's in a superb biking part of France. Go there immediately! Website here: "Burgundy Bikers"
Well, he's begged and begged and I just couldn't say no to him any more......Here then ladies and gentlemen is "Nick's Site" also known (probably more accurately) as "The Worldwide Wobble"
What you'll make of this one I've no idea....Alex and his incorrigible mates, all patrons of the Gay Bar, have set up camp (!) here: "The World Famous Gay Bar and Hosiery Club" also known as "The Revenge of the Pink Panter"
"HDM - TRIUMPH Dealer - Melle"
OK...your bike's broken down, you're in the middle of a two-wheel transport drought and your significant other is threatening divorce unless you take him/her fishing/abseiling/gastro-gnoming...Well...your troubles are over! Check these good people out (especially the "Activity Breaks" page....) "France on line"
Check out TWOZERO for bum-bags, reflective stuff and practical gear that's been designed for bikers, by a biker. It's a company that belongs to a chum of mine so go there, mention my name and I'll be sent a Tesco token up to the value of one shilling. NO! SERIOUSLY! 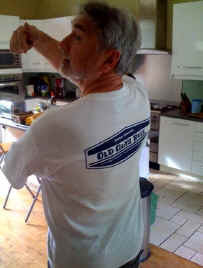 Those of you who come more than 3 times a year (which, let's face it, is most of you....if you lot ever get a life I will be seriously out of business.....but I digress..) will know that I foist a flourescent tabard upon the tail-ender so that he'll know who he is and also so that the rest of us can recognise him for what he is. Well, I've tried a number of different manufacturers over the years and they've all self-destructed pretty quickly. TWOZERO on the other hand have shown their flouo tabards to be rugged, well-made and indescribably dashing. IAM approved (well, you can't have everything) so dash over there and have a squint. No, really, they are VERY good. The LEADER - knows where we're going!.... The RIDERS - That's you and hopefully you'll be following me. At any point the route deviates I will signal the bike immediately following me to stop so as to mark the junction for the following riders (this rider then becomes a JUNCTION MARKER. D'oh!). He will stay there, in a safe spot clearly visible to the approaching riders, watching the group go past, until the tail-ender arrives. The Junction Marker then moves off ahead of the tail-ender and becomes one of the "Riders" again. I will repeat this every time there is a change of direction and so you will all get an opportunity to be a Junction Marker. Overtaking is fine and is in fact essential for the smooth operation of the system, but please be careful and courteous in all overtakes! The TAIL-ENDER - will stay at the back for an entire section of the ride (from leaving the house to the first coffee stop, for example) and will be wearing a hi-viz tabard to make him clearly visible to all the other riders in the group. The tail-ender is exactly that, nobody else in the group should ever get behind him and he will move the "Junction Marker" on ahead of him once he arrives at the junction. If anyone drops out of the group the Tail-Ender will stop with them and find out what is going on. If there is a problem he will get in touch with the leader, or if they are just stopping for a wazz he will wait with them so that the next marker, further up the road, stays in place until they both arrive. The result is that nobody has to worry about getting lost. Even if you can't see any bikes ahead of you, you know that they'll be waiting at the next junction. Everybody rides at their own rate, nobody has to pedal harder than they want to. It works brilliantly and means that a group with differing skills and experience can travel well together although spread out over a mile or two of road. 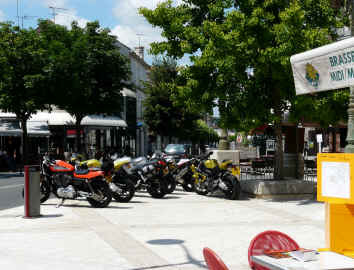 By the first coffee-stop of the first day, you'll have totally understood the system and can forget about being lost or left behind and get on with improving your riding. What should you know before you come? Passport, bike registration docs, insurance. You will need some form of European breakdown insurance. The AA, Green Flag etc do good cover. 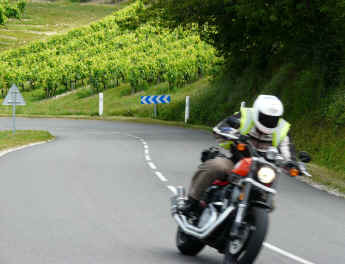 Check with your current insurer what’s on offer and also confirm that your bike is fully insured for the trip to France, BOTH FOR ACCIDENT AND BREAKDOWN (a lot of the companies are NOT offering recovery for bikes involved in an accident, check it out!). 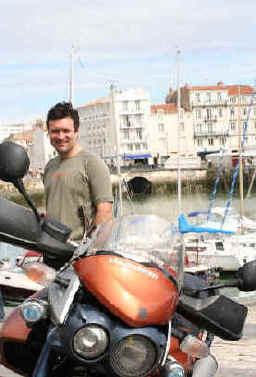 MAKE SURE THAT YOUR TRAVEL POLICY COVERS YOU FOR BIKES LARGER THAN 125CC!!!!!!!! Seriously, this was a major issue in 2007 with a rider needing medical/repatriation assistance and finding that he was NOT covered as he thought. Check it out! Take photocopies of your docs and keep them separate from your originals. You WILL need the the EHIC card which can be obtained free from your local post-office. This enables you to recover any medical costs incurred in France. You will be covering around 1600 miles so make sure that your tyres and chain can make it and that you’re not going to miss a major service. Coolant, tyre pressures, brake pads, discs, oil and brake fluid levels should be checked. Check for leaks around the engine and fork seals. The official word is that you will need to blank off the thrown-beam section of your headlamp lens with some insulating tape and you'll need a GB sticker. 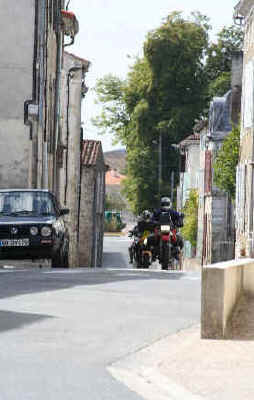 Once down here we have a Triumph dealership in town and there are the usual suspects (Nippon/German/Italian) in Niort, 20kms away. You can get them down here with about a 10% saving over the prices in the UK (depending on the exchange rate - check with me first). If your tyres are part-worn, finish them off on the way down and get a new set at the end of the day's ride on the Saturday. Let me know your make and model and I'll get you a quote. Hard panniers are good. If your bike doesn’t come equipped then throw-overs or a tail-pack are good alternatives. 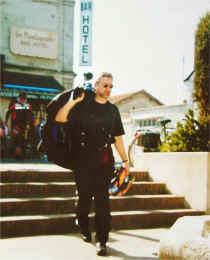 A tank bag is very useful for documents, camera, route cards, maps etc. make sure that whatever you have is waterproof. If you don’t have soft pannier covers then wrap up all your stuff in bin-liners before putting it in the panniers. You won’t need too many clothes. Enough shirts/T-shirts for four days, a pair of jeans, a sweater, a fleece-type jacket, and some walking shoes (in case you have to push your bike anywhere...). A little black dress for the evening and a simple string of pearls is always very elegant. It really depends which time of the year you've decided to come down. Weather in April/May and September/October is usually gorgeous but the mornings and evenings can be a bit chilly. Bring some thermals (or equivalent…I don’t want to know) if you're coming at that time of year. For the summer months you won't have any need of warm weather gear, whether it rains or no, the temperatures will remain comfortable. Leathers or Goretex suit (all preferably with some form of armour), sweat-shirt, winter gloves, spare gloves (summer? 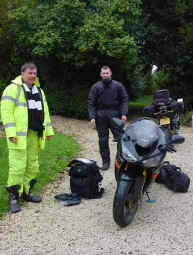 ), rain-suit, neck tube, Vee-wipes, Visor demist, boots. Helmet with a clear, unscratched, visor. I don't anticipate riding at night so a tinted visor will probably be OK, but how are you going to get down to Portsmouth Thursday night? Take a clear visor as well, whydoncha? EARPLUGS! Sunglasses, camera, chocolate, fruit-juice, energy bar…..whatever. DRINK LOTS OF WATER ON THE WAY DOWN! Once you're all down here I'll be leading you out over the four days on four circuits which take in some great biking roads and will give us the opportunity to visit Oradour sur Glane. We will all start in the morning with full tanks and then stop for petrol every 100 - 120 miles. We will stop for coffee in the morning, for lunch and again for coffee in the afternoon. 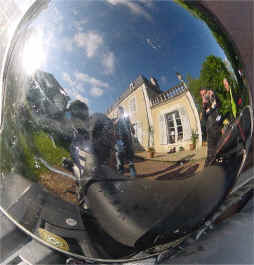 The accent is very much on riding; we will leave the chateau at 10h00 and won’t be back until around 17h00. We will have covered 200 miles in that time. 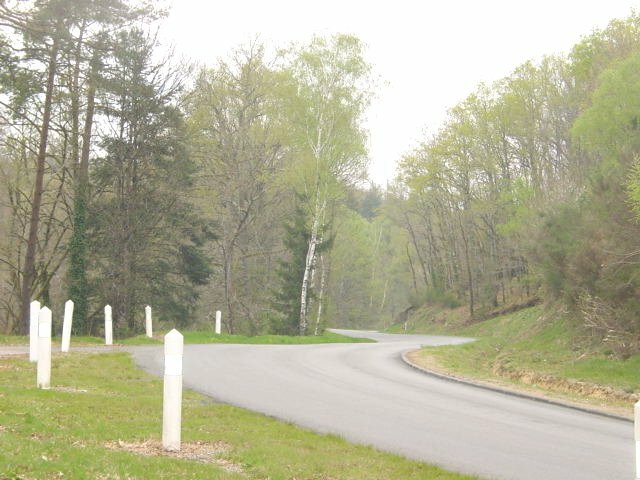 Riding will be on well-maintained B-roads. 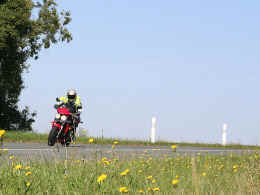 There will be 0.00 kms of dual-carriageway riding during the weekend, so come prepared. NOBODY WILL GET LOST NOR WILL THEY HAVE TO PEDAL LIKE MAD TO KEEP UP WITH THE LEADERS! (see "How we ride"). The one thing to be avoided at all costs is for you to feel pressured into riding at a speed where you feel uncomfortable, be it too fast or too slow. Will love us. People in villages will wave and cars will do whatever they can to give us space for overtakes. Thank them with a wave (or rather, extend your right leg. Honest!) and don't sit too close to them prior to the overtake. Remember we could be in a group of up to 11 bikes and if number 3 annoys a motorist then the others are going to have to deal with him when it comes to their turn to pass him. Courtesy rules! It’s a good idea to take a good map. Michelin make the best and do a little one in book form which shows all the major routes and towns and which costs about 4 euros. 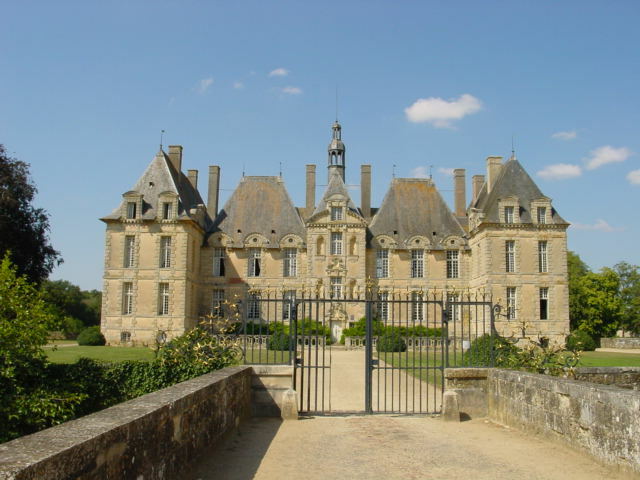 (£3.80) You will each receive a detailed route card in any case that shows distances between points and the contact telephone numbers and address of the chateau. You'll all have my mobile number and you can use this should you become separated. Teller machines will accept British cards providing you have a PIN number. Be aware that when you use your card to pay for petrol at an automated pump your card will be debited a "maximum" amount of around €120. This is also true in the UK. The difference lies in the fact that in the UK the bank automatically and immediately calculates the difference beteween the maximum figure and your actual purchase and credits you the difference. Using your UK card in the rest of Europe it may take up to a week for the credit to appear on your account. This can mean that after 5 fill-ups your card might be showing a debit of approx €600. It's easy to max out over a week's travelling. If you're travelling with a mate then double up when filling up and spread the strain between your two cards. This is our HOME you're talking about! We're really happy to welcome you and we will have some great evenings round the (very big) dining room table. 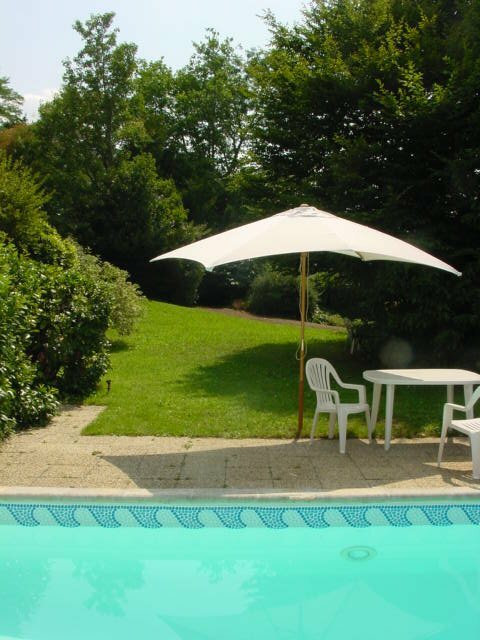 There's lots to do at the evenings in the house (pool, tennis court, ping pong, "baby-foot") or you can chill outside in the park with a good book. As we don't smoke I'll ask you, please, to smoke outside. We'll supply firebuckets and flame retardant overalls. The weekend includes continental breakfast, evening aperitif and dinner. 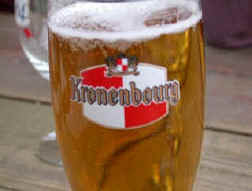 Wine, beer and soft drinks are included during your meal. We DON'T do spirits. There's a reason for this: I like you to be fully functioning in the morning! If you want to go out there are bars in the town (250 metres away) and even a jazz bar. Past trips have been very good fun. 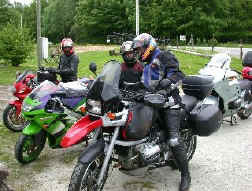 The riding has been great and the company as good. By the time we get back to the chateau in the evening you will be glad to park the bike up, hit the shower and get ready for dinner. During the day coffee and lunch stops are normally chosen on aspect and availability. 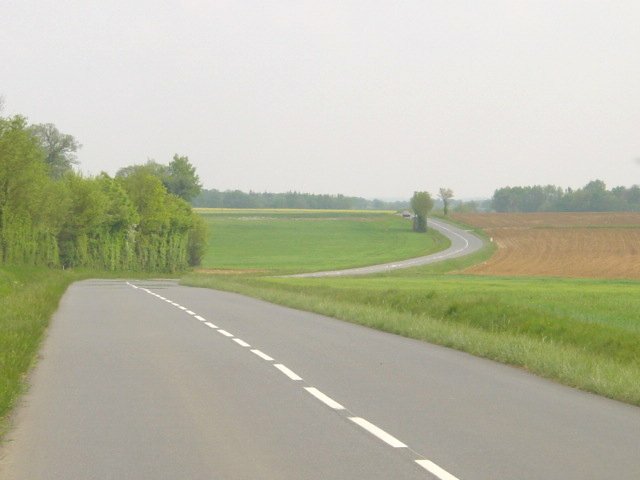 We're located 60 kms south-west of Poitiers, or 22 kms due east of Niort, in the Deux-Sevres département of France. The town is Melle, and it's great! 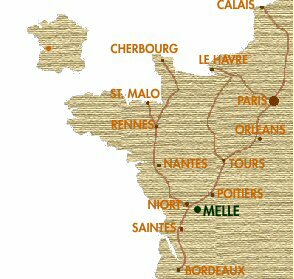 Melle is about 750kms from Calais or 450kms from Cherbourg or Le Havre. There are direct routes via A and B roads with some interesting twisty bits on the way down or you can choose to go the whole way on the motorway route, which will get you to within 15kms of Melle, whichever port you're coming from. We are about 250 metres from the town square and there all the normal facilities of a small French market town. There are 7 bedrooms available for visitors, most of which have both a double and a single bed, allowing for either couples or singles sharing. This is a private house and the rooms are therefore not en-suite. 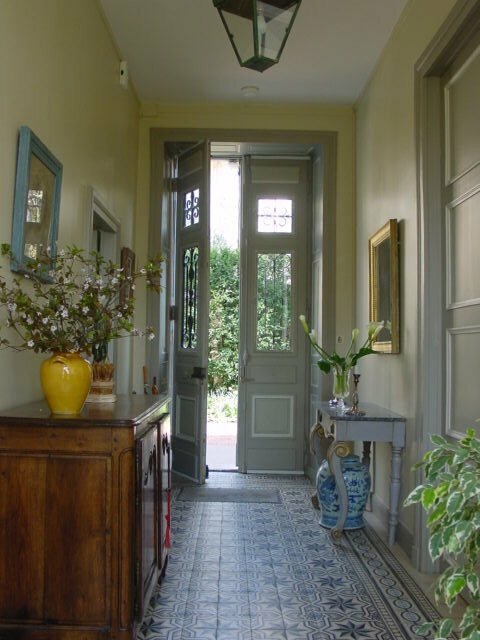 There are however three bathrooms in the main house, one in the annexe (where there are two of the bedrooms) and a total of 6 or 7 loos (I forget). We cook for and eat with our guests and the food is French and very good. The weekend is on a half-board basis and so you will get breakfast and dinner. 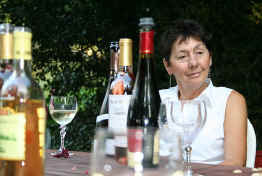 Food and wine are locally produced and are excellent. The wine and beer that you drink with your meal is included in the overall cost for the weekend.